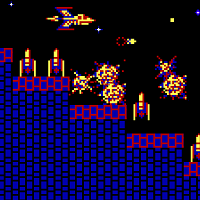 A free, old-school side scrolling shooter arcade game. With six stages of side-scrolling space shoot-em-up fun to survive through, you’ll encounter the persistent and unyielding enemies from the original along the way to the final Enemy Base, which you’ll have to destroy to complete the level. It’s been coded solely for Android devices from the ground up, offering an extremely fast, smooth experience with great player controls which will submerse you in a nostalgic sensation – stemming from the era when games were fun, rather than just graphically superior. You are allowed (and encouraged!) to put footage of Scrambler on YouTube or any other website.